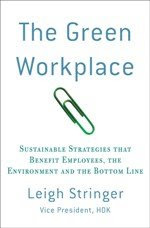 The Green Workplace: Greening Your Greens? Many workplaces engage a florist to provide weekly/biweekly floral creations to grace their front reception area. My office is no different. Over the years, we've tried a number of different options, ranging from professional florists to amateurs from the office designing arrangements. Our latest attempt with a professional florist turned out disastrously...for a high price, we were receiving very "artistic" creations, such as an orange in a glass bowl of rocks with some twigs sticking out of the top. Perhaps innovative to some, but just plain weird to most. We'd tried live plants, too, but they never looked right and no one could truly get the care down pat. Two months ago, we started a new program - rotating plants. Essentially, we 'lease' a plant (in our office, we've selected orchids). The plant stays for a set period of time, then is picked up and switched out by the vendor. The "used" plant goes back to the shop for some TLC. Some are resent out to clients, others are sold. Last night, I was walking by the shop and saw a bunch of orchids out for sale - they were some "old" rotating plants that were deemed no longer suitable for office lobbies, but PERFECTLY suitable for my little jungle at home. A true bargain at $10. I wonder what the odds are I can keep it looking good? I think it's a great idea, to be honest. keeps lobbies fresh, and limits the number of plants cut or gone through.